So I missed National Popcorn Day. It was January 19 — not be confused with National Popcorn Month which is October or Caramel Popcorn Day which is April 7. 1. Each kernel contains a tiny drop of water. This is why, when heated, the water expands causing the kernel to explode and flip inside out. 2. Popcorn consumption declined significantly during the 1950s with the invention of the television. As Americans stopped going to the movies, they stopped eating popcorn. That is, until microwave popcorn restored the snack's popularity. 3. The world's oldest piece of popcorn, at 5,600 year old, was found in a bat cave in New Mexico in 1948. 4. The average American eats 17 gallons of popcorn a year. 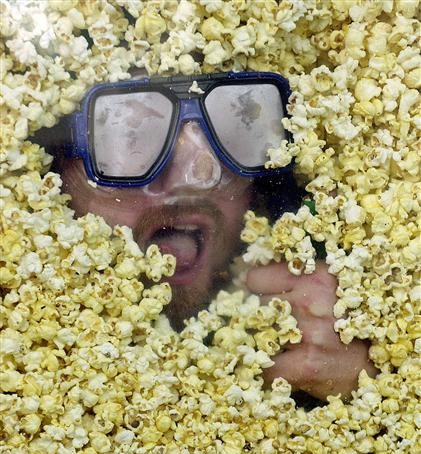 As a whole, America eats 4.3 billion gallons of popcorn a year. 5. Some Native American tribes believed their ancestors' spirits lived withing popcorn kernels. When they got angry from homes overheating, the kernels would explode leaving puffs of smoke in the air.